"This is a highly-customised, portable version of the stationary gatling gun operated by the old hunter Djura in Old Yharnam. It was the weapon of choice of the youngest of Djura's three companions. The Gatling Gun boasts exceptional rapid-firing functionality, but is considered a cumbersome weapon, due to its excessive weight and insatiable consumption of Quicksilver Bullets." Hunter's Nightmare, cave to the right after getting out of the building that used to be the shortcut to the Cleric Beast in the main game. Gattling Gun Hunter drops the weapon. Amygdalan Arm and a Blood-Starved Beast can be also found here. Bone Marrow Ash currently is not worth applying. The bullets spread out over a distance, making it more practical to use it closer in. The bullets can also stagger and knock back most humanoid opponent. 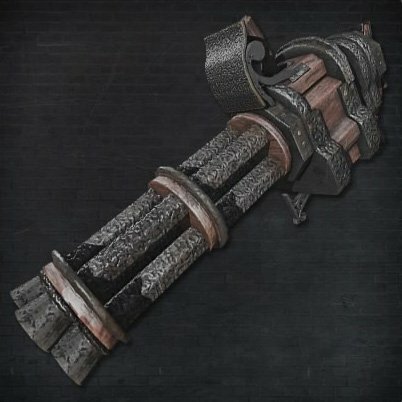 A +7 Gatling gun with a decent gem can do between 2 and 3 thousand damage with its 20 quicksilver bullets, good for finishing off a boss or certain kinds of enemies. It's also a good weapon in co-op for pulling aggro away from allies. Martyr Logarius and Gehrman, The First Hunter's second phase can deflect firearm bullets, rendering the Gatling Gun useless. I am heavy weapon guy, and this... is my new weapon, she weighs one hundred and forty two kilograms in weight and Fires 200 custom made cartridges... it cost 400 thousand dollars to fire this weapon for twelve seconds. 99 Bloodtinge and a 31.5% Cursed gem on this thing +10 and the AR is 331. It&apos;s a very efficient use of bullets. With just 5 blood bullets I can do over 2k damage. the tracking is great and keeps opponents on their toes, It compliments perfectly with a bloodletter build. I&apos;ve killed plenty just by unleashing this beast alone. No idea what I did wrong here. I&apos;ve done literally nothing different from the last 5 times I went for this weapon. The NPC that drops it doesn&apos;t spawn for some reason. If anyone knows why this is, please help. I guess I&apos;m using the only boom hammer and gatling gun from now on. For the Emprah! Highly useful against this guy. Numbing mist is highly recommended too as he tries to get away and heal once under half health. Basically, just don&apos;t let him get up from beast roar and hammer into him with a fast thrust weapon with bolt or fire added. does the buff only affect the first shot or a few after? I swear, one of these days I&apos;m gonna insert an armored core disc by accident. Not that I will complain about it. So I assume that someone has already taken the initiative to make a Rambo build, using only fists, beast roar and gatling gun. And that their character looks like Sly. You can use it to sneak behind the hunter using the Gatling Gun to get a Visceral Attack on him. Is it just me, or do the beast behind the minigun hunter just ignore him when they&apos;re brought to each other (Iike luring the beasts to him)?